New Zealand has a fine tradition of children’s literature, with many wonderful authors to sample and enjoy. Did you know many are also available to borrow through our eLibrary? 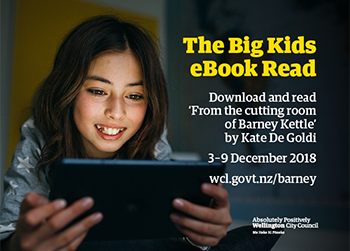 In December (from the 3rd to the 9th), we’ve joined with Penguin Random House New Zealand and celebrated Wellington author Kate De Goldi to provide unlimited eBook loans of her children’s fiction title, From the cutting room of Barney Kettle! On a smart phone or tablet — download the Libby app to your smart phone or mobile device, add Wellington City Libraries as your library, and log in with your library card number and surname to set up your account. Search for ‘From the cutting room of Barney Kettle’ to borrow your copy and start reading. 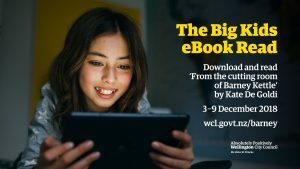 Users of computers and eReaders, including the Kobo range of eReaders — you’re not left out! Find out more about borrowing our eBooks on our Getting Started with our eLibrary page. Surprising, gripping, heart-breaking and ultimately incredibly moving, this novel stood out right from the start. This book is packed with warmth, wonderful language, rich and witty observations, compelling characters and layers of message and meaning. Meet filmmaker Barney Kettle, who liked to invent stories but found a real one under his nose. So begins the manuscript written from the hospital bed of an unnamed man. Join us as we read this brilliant eBook title together across Wellington in December — at school, at home or in the library, we’ll all be reading together! Huge thanks to Penguin Random House New Zealand and Kate De Goldi, for your support of this exciting opportunity for Wellingtonians!